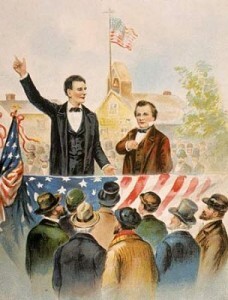 While researching the historic Lincoln-Douglas debates of 1858, I uncovered a video on YouTube that would great for teaching younger audiences about the debates. “The Lincoln Douglas Debates” condenses an overview of the 1858 debates into a simple format designed to keep children engaged. The video’s runtime reaches only two minutes, fourteen seconds and uses both voice-over acting and background music to catch and maintain the audience’s attention. I recommend this site for anyone who wishes to gain a basic background of the debates through a simplistic and entertaining format.